Did you see Josh Barrie's article on deep fried food in the newspaper yesterday? It scared me to death and death is close by if you consume too many of the delicacies on his list. Yet deep-fried food is undeniably one of the most joyful parts of Britain's cookery landscape; whether piping hot funfair doughnuts that hit the mouth like a fluffy steam train or crispy courgette flowers at upmarket London restaurants. Nevertheless, deep-fried food shouldn’t be consumed frequently - but there's nothing wrong with an occasional treat. Here are a few regional highlights from Josh's article that will make you want to put down your celery smoothie and prepare for a crunchy taste sensation. It is rumoured to have been invented almost 25 years ago, and has become a legend north of the border. 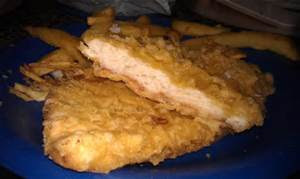 While deep-fried food suffers from a bit of a bad reputation today, delicacies bathed in hot oil are often met with caution and disdain. Here’s another delicacy native to Scotland. 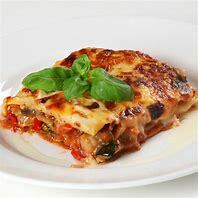 It’s fusion food, if you think about it, putting a little bit of Italy inside Scotland’s cosy embrace. The dish - which is especially popular in Fife - is almost a homage to Naples, where locals dry fry their pizzas. And yes, it's probably a once-in-a-lifetime thing. Hull patties are historic in the city – and hopefully there will be plenty available when we all visit for its 'City of Culture' year in 2017. Hull patties are deep-fried patties of mashed potato with sage. Soft in the centre, crunchy around the edges, they’re like giant chips, only better. Chippies have their own recipes, each one fiercely guarded. Josh discovered these thanks to a friend who spent his early childhood in Carlisle. Every Friday, his friend would get fish and chips, and on one outing he requested ‘squibs’. The friendly Chinese takeaway owners had no idea what ‘squibs’ were. Apparently, they're the ‘off-cut’ batter bits you find floating about in the oil – little golden nuggets. Word of this indulgence spread, and soon everyone in the neighbourhood ordered them. Soon, they were sold for 10p a bag and at weekends even pre-packed and rested under the hot light. A seaside classic. 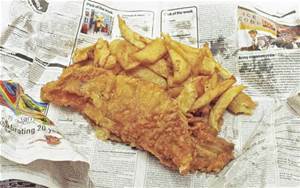 Brighton is the spiritual home of fish and chips, probably the most famous way of using the deep-fry method. Sitting in the sun while turning your blood into vinegar, your tongue into a salt bed, all the while gazing out to sea, is one of the greatest things to do in the world. Time for dessert. At Edinburgh's The Fiddler's Elbow chippy, frozen balls of butter are fried, then served with Iron-Bru ice cream and coulis. A variation with whisky batter is also available. Remarkable says Josh. 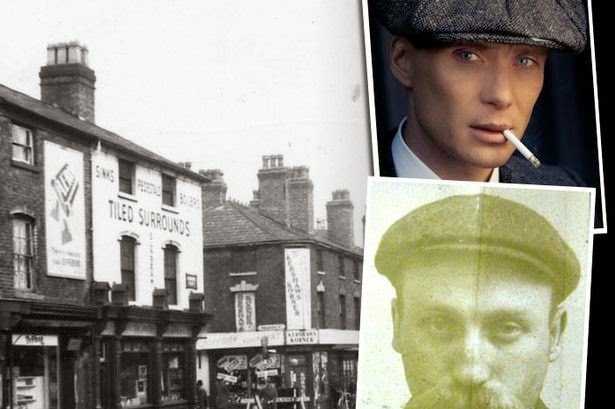 A Middlesborough classic. 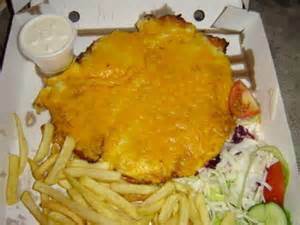 It sounds vaguely Italian, but the parmo is a true dish of the North East of England. It consists of a large, deep fried flattened chicken breast, smothered with a white Béchamel sauce and incredible quantities of cheese. 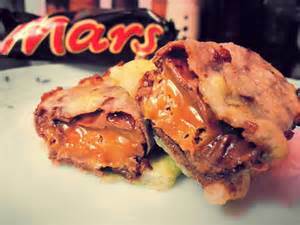 Supposedly, it was invented by a former American army chef who moved to Middlesborough after the Second World War. You've heard of black pudding; now, meet its blushing cousin. This East Scotland chip shop favourite is a deep-fried mix of bacon, pork , suet and colouring. There’s no better way of elevating a mushroom’s rich flavour than breadcrumbs. The technique dismantles their sloppiness. Naturally, London took them further – Pitt Cue's deep-fried pickled shiitakes are a thing of legend. In a Cardiff chippy called Mister Eaters, ‘chipshakes’ are on the menu – balls of flour and milk, deep fried until golden. Funnily enough, Scotch eggs aren't really Scottish But the Manchester egg is Mancunian through and through. 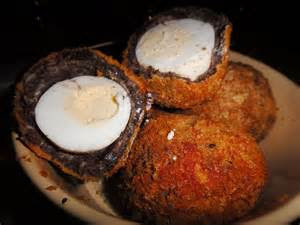 It was invented in 2010 by chef Ben Holden , and consists of a pickled egg encased in Bury black pudding then deep-fried. Heart attacks on a plate!